Separating African Grass-Owls and Marsh Owls in the field. The African Grass-Owl Tyto capensis is a habitat specialist and is largely restricted to the Grassland Biome in Southern Africa. It is listed as Vulnerable by Barnes, K.N. (ed.) 2000. The Eskom Red Data Book of Birds of South Africa, Lesotho and Swaziland, which gives an estimated population of less than 5,000 birds. This assessment was based on data from the first Southern African Bird Atlas Project (SABAP 1) however and, as such, is seriously dated. birds becoming entangled in barbed wire fences. Comparison between SABAP 1 and 2 data suggests that the status of the African Grass-Owl has declined still further and accurate current distributional data is urgently needed to allow for a re-assessment of the species’ conservation status, and also to help formulate an effective conservation management plan. A targeted atlassing effort has therefore been proposed to search for Grass-Owls in areas where they were reported during SABAP 1 – this in an effort to confirm, and also measure the apparent decline in the status of this species. African Grass-Owls and Marsh Owls Asio capensis both favour areas of open, rank grassland – habitat typically associated with drainage lines, vleis, pan edges etc. They are often found in close proximity to each other, with active roosts of the two species sometimes being located as close as two meters apart. Where Grass-Owls and Marsh Owls co-occur however, the latter species is usually more common and may outnumber the former by between 7 and 10 to 1. Given the fact that most atlassing observations are likely to be of birds flushed from their daytime roosts and then flying away from the observer or, alternatively, of birds hunting in low light conditions at dawn or dusk, there is a real risk of misidentifications entering the SABAP 2 database. To help prevent this, the following ID pointers are offered. Grass-Owls and Marsh Owls both roost and nest on the ground in areas of long grass. Typically, Grass-Owls require longer (knee-high plus), and denser areas of grass or sedges than do Marsh Owls for roosting or nesting – freeing the latter species to occupy a wider range of grassland habitats. Between Bredasdorp and Arniston in the Western Cape, African Grass-Owls roost and nest in dense knee-high restoid vegetation adjacent to renosterveld fynbos along the small riverbeds adjacent to cultivated land. In the Grass-Owl, long-term roosts or nests take the form of well-established tunnels that the birds create by bending over the tops of the grasses/sedges so that the tunnel is invisible from above. Tunnels are usually floored with a pad of trampled grass which may have been “nipped off’ by the owls. Tunnels can be up to about (1) one meter long and often have a primary entrance on one end and a secondary (or emergency) entrance/ exit at the other. Marsh Owls on the other hand do not typically create well-formed tunnel structures but either push their way into the side of a grass tussock or bush etc., or simply roost under the spreading canopy of a tussock or bush. As a result they are often visible from greater distances than is the case with Grass-Owls. Regular roosts, and also nests, may be floored with a pad of trampled grass however. The behaviour of these two owl species differs markedly when they are flushed from roosts and nests and this can be used to support identification. Grass-Owls normally remain hidden in their roost tunnels until the last minute before flushing. They then usually fly directly away from the observer before dropping back into the grass some distance away. 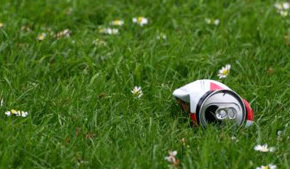 Only rarely will they circle back to observe the intruder before taking refuge in the grass – behaviour more commonly associated with females that have been flushed off active nests with either well-set eggs or chicks. Even in these cases actual aggression is rare, with the adult usually only giving Barn Owl-like screeches as it flies past the intruder. 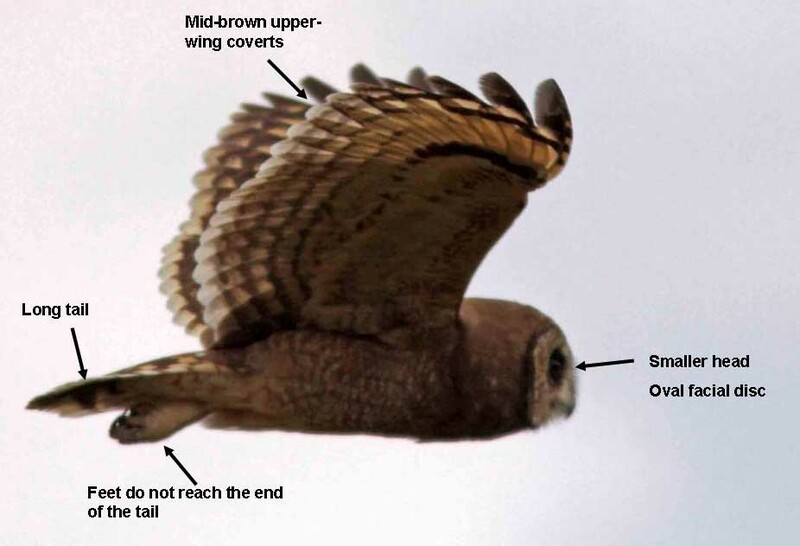 In flight, the upperparts of this species are dark blackish-brown – and usually appear much darker than Marsh Owls. Grass-Owls also appear rather short-bodied in flight – with their massive heads and large heart-shaped facial discs creating the impression of a ‘wedge’ flying blunt-end first. The outer tail feathers are whitish and appear paler than those of the Marsh Owl in flight. The feet project out well beyond the end of the tail and this feature is distinctive in separating the two species in flight. 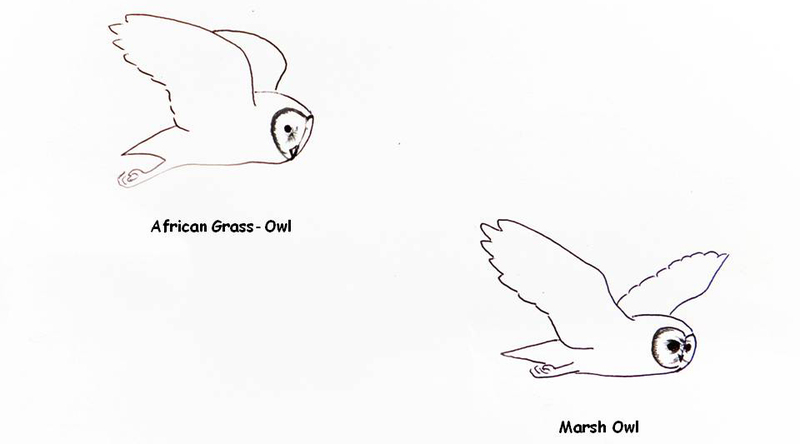 Grass-Owls are also larger than Marsh Owls and, with experience, this size difference is also useful in separating the species – particularly in low light. In some areas (such as Midmar in KwaZulu/Natal) Barn Owls Tyto alba may also co-occur with African Grass-Owls and could potentially hunt over similar habitat. In such instances, the larger size and darker upperparts of Grass-Owls should help prevent miss-identifications. In contrast, Marsh Owls usually circle the observer several times before dropping back into the grass. When flushed off active nests, females also tend to be a lot more aggressive than Grass-Owls – often repeatedly stooping low over the intruder and giving loud frog-like croaking calls. In some cases males may also join in these attacks. Marsh Owls also often use distraction displays such as “broken-wing” displays or repeatedly crashing into the grass in an effort to lead the intruder away from the vulnerable eggs or young. 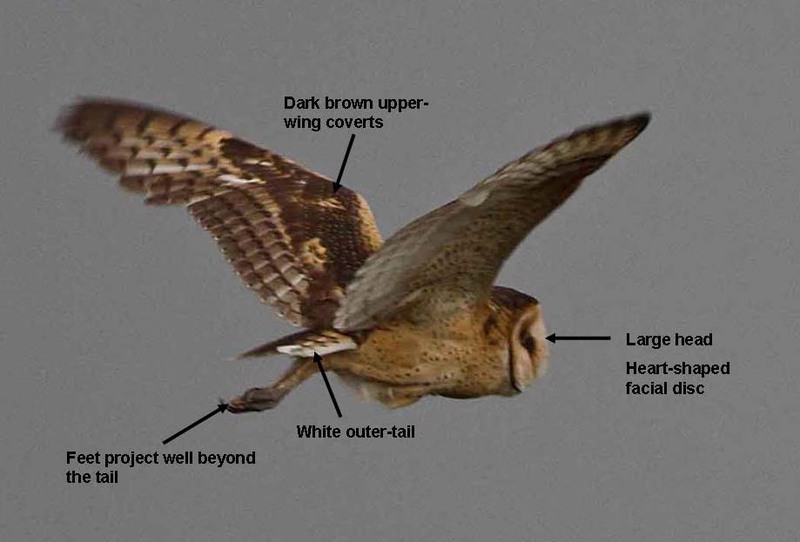 In flight, Marsh Owls appear longer-bodied and more ‘strung-out’, with oval (rather than heart-shaped) facial discs. They are longer-tailed and shorter-legged than Grass-Owls and the feet do not project beyond the end of the tail. Both owl species hunt by patrolling low over the grassland and there is a considerable dietary overlap in the prey recorded for the two species. Grass-Owls tend, with only rare exceptions, to be strictly nocturnal hunters – only leaving roosts or nests well after sunset and taking to cover again before sunrise. Marsh Owls however are often active before it is fully dark and between March and June, when these owls are often feeding nestlings, they regularly hunt in the afternoons, and may also continue hunting until mid-mornings. This species also perches more regularly on fence posts and other structures when hunting. Both species may regurgitate pellets at their roost/ nest sites. These are comprised of the undigested remains of the prey – fur; feathers; bones etc. and differ in shape, size, colour and texture depending on the species of owl responsible. If an owl is flushed, and the subsequent flight views are inadequate for confident identification, it may therefore be possible to determine the species based on the appearance of any pellets found at the site. Grass-Owl pellets are typically oval in shape and dark in colour, often with a “varnished” appearance created by the dried mucous coating the pellet. Bones within the pellets, including the skulls of any rodents or birds are usually largely intact. arthropod remains than are found in Grass-Owl pellets. Most rodent- or bird limb bones and skulls are badly fragmented in these pellets. Figure 3: Sketch summarising the differences between the two species in flight. A word of caution – remember put the safety of the owls first! It is important to understand that repeated visits to any active roosts or nests you discover can negatively affect the habitat around these sites through trampling and that the increased disturbance could also lead to the adult owls deserting the area. There is also a risk that such visits will, in a relatively short time, create a trampled pathway which could then lead any mammalian predators such as Serval, jackal, mongooses etc. in the area directly to the nest or roost – putting both the adult owls, and also any chicks at risk. To prevent this, avoid disturbing Grass-Owls between February and June when they are typically nesting. Please restrict the time spent at any roost or nest that you may locate and avoid returning to these sites. Also refrain from broadcasting the location of any roosts or nests to others as ‘birding’ pressure on such ‘known’ sites has already led to the collapse of local populations in several instances. African Grass-Owls are already under pressure and irresponsible or unethical behaviour by birders poses a significant threat to this vulnerable species. Please don’t add to the problem!